— Sen. Bob Corker (R-TN), quoted by The Hill. Of all the astounding things that have happened since Donald J. Trump took office – the serial lying, the trade wars, the bizarre North Korean summit, the gruesome separation of asylum-seeking parents from their children at the U.S. border, the Scott Pruitt scandals, the indictments, the embrace of despots and the savaging of allies just to name a few – the most astounding thing is how easily Trump has co-opted an entire political party. There is simply no parallel in American history. Republicans, most quaking with political fear that crossing Trump or pushing back on his myriad outrages will get them the Jeff Flake treatment have, of course, only themselves to blame. They let an amoral, lying charlatan capture their party and imperil our democracy. Still, amid the craziness, it is an amazing thing to watch the destruction of the Republican Party in real time. For years most Republicans have chosen to tolerate and then embrace the crazy La-La Land of Fox News, Rush Limbaugh, Breitbart, conspiracy theories and systematic denial of obvious truths. Most of the Republican base finally came to embrace the racist notion that the 44thpresident of the United States is a foreign-born Muslim. The intellectual rot, as Steve Schmidt the GOP strategist calls it, is truly stunning. A tiny handful of principled conservatives – Schmidt, Charlie Skyes, Michael Gerson, Jonah Goldberg, David Frum and Bill Kristol most prominently – have called out this foolishness, but Republican intellectuals appealing for GOP sanity is a lost cause in the Age of Trump. Steve Schmidt now says he is a non-practicing Republican and he wonders if the party, even after Trump, can ever find its way again. And Charlie Skyes, a conservative with a sense of gallows humor, titled his latest book How the Right Lost its Mind. The answer to that question is simple: It all began with lying, half-truths, fabrications, blind anger and disdain for the arts of governing. 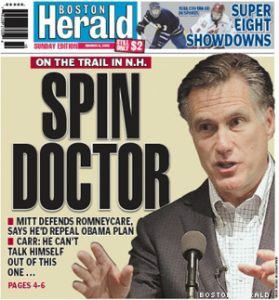 Rather than offering serious alternatives Republicans chose to demonize Democratic efforts to address the health insurance crisis, turning tail on the very policies one-time GOP presidential candidate Mitt Romney embraced as governor of Massachusetts. They spent decades bemoaning spending and debt then passed a massive tax cut for the most well off Americans arguing that their policies won’t balloon the debt and actually help the middle class. The truth is precisely the opposite. Republicans have doubled down on climate change denial by putting a corrupt grifter in charge of the Environmental Protection Agency. They savaged, then abandoned an international agreement to prevent Iran from developing nuclear weapons and now hold their breath hoping to get an agreement as tenth as good with North Korea. The Republican base now thinks better of a murderous North Korean dictator than of Nancy Pelosi. Let that sink in. And Trump’s efforts to destroy generations of foreign policy consensus regarding NATO, the G7, etc., while celebrating dictators from Moscow to Pyongyang will have lasting impact. He barely listens, and won’t read. In the GOP’s La-La Land one-time critics in the Congress are cowed and running scared. 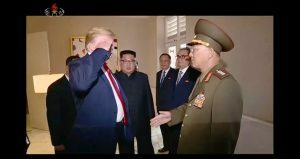 Even worse are the true believers, people like Idaho’s Jim Risch who would have levitated over the Capitol had Barack Obama taken a meeting with the North Korean dictator, handed over concessions and gotten nothing at all in return save a photo op. Risch, who regularly brags of his many conversations with Trump, dismisses any concern about the president as being the product of “tremendous hate and vitriol against President Trump from the other side in this town.” This isn’t your father’s GOP. It is a cult of personality built on lies, unethical misbehavior, craven love of power and – did I mention – lies? Lindsey Graham, once verbally assaulted by Trump as a lightweight, now Tweets birthday wishes to the president who called the murderous North Korean dictator “a funny guy” who he trusts. The GOP intellectual rot begins in such fevered brains. Republicans steadfastly refuse to re-authorize the Voting Rights Act, while putting a white supremacist in charge of the Justice Department. Meanwhile, at the state level the GOP perfected the ancient art of gerrymandering allowing most House Republicans to pick their voters instead of the other way around and in the process making voting much more difficult for millions of Americans. Needing an issue to enflame the nativist base of the party they now own an immoral, barbaric, un-American policy that separates kids from parents seeking asylum in the land built by immigrants. Fearing – and likely knowing – that Trump is as crooked as a dog’s hind leg they trash the American justice system and consider the Republican special counsel investigating Russian interference in our politics as some dark “deep state” conspirator. To repeat for emphasis Robert Mueller is a registered Republican, a decorated Vietnam combat veteran and a man of sterling personal qualities and professional ethics. 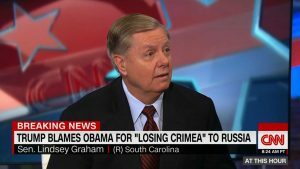 The president of the United States repeatedly labels his work “a witch hunt” and guys like Graham and Risch smile and pray not to get a primary challenge. Republicans officeholders have been working on handing the country over to Donald Trump for a generation. They have valued power over principle, polarization over policy. They have been lying to their base for so long that, not surprisingly, people started believing the craziness. Now Trump owns them. They are afraid of losing an election or slipping out of power and they have fully acquiesced to his lies, his personal and moral dishonesty, his dangerous and deranged foreign policy, his racism and, most troubling, his ever more obvious authoritarian ambitions. 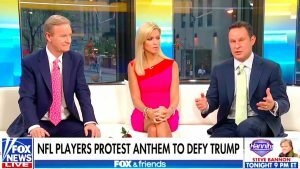 Last week Trump told Fox & Friends, the nut job echo chamber that feeds his gargantuan ego, that his new North Korean friend is “the head of a country — and I mean he’s the strong head. He speaks and his people sit up in attention. I want my people to do the same.” Later Trump said it was just a “joke,” but that same “joke” has been used in the past to discount the kind of language that authoritarians regularly use. The journalist Andrew Sullivan says Trump is “openly living in his own disturbed world” where whatever he says is true and whatever contradicts his truth is “fake news.” And the Republican Party, witness the comment from the party chairwoman, has accepted this new reality. “Anyone that does not embrace the Donald Trump agenda of making America great again will be making a mistake,” says Ronna McDaniel. By the way, Ms. McDaniel for a long time used her maiden name – Romney – until Trump said he didn’t like it – she’s Mitt Romney’s niece – so she quit and now has a name approved by the Great Leader. Democracy Dies in Darkness is the new motto of the Washington Post, a newspaper that daily tries to sort out the various strains of wretched weirdness that is the Republican Party, but the newspaper motto gets at only part of our problem. Democracy actually dies when lies dominate the daily political discussion, when ethics get ignored and when principle has no place. 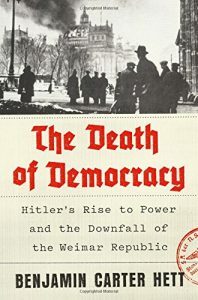 I’m reading a new book on an old story, how the Weimar Republic in Germany collapsed amid the lies and nationalism and racial hatred that ushered in the darkest period in modern history. Historian Benjamin Carter Hett writes that a crazed Austrian postcard painter figured out the essential truth of the authoritarian long before we got Donald Trump. There is an authoritarian playbook, well worn and often remarkably successful. The would be authoritarian lies about everything to the point that enough people no longer care about the truth. A free press is put to the torch. Convenient enemies – immigrants, Muslims, any opponent of the leader – are daily attacked. The rule of law is subverted. Financial and ethical norms are ignored. This is where we are, fellow Americans. It’s the lies, my friends, it’s the lies. The postcard painter knew the path to power. Lie bigly. Lie always. Lie. Lie. Lie. Lie to demonize the other side. Lie to discredit the press. Lie to protect your privilege. Lie often enough, loudly enough and pretty soon no one knows what to believe and the authoritarian has his day. It has happened before. It is happening again. More on The Death of Democracy next time.